Catwoman: We run away to Europe together, sip tea in a café, and live happily ever after. Catwoman: And, of course, we kill Robin. Batman, eh? Are you a fan of the Dark Knight of the Camp Classic? Or both? Because, if you’re a fan of both, then I think you’ll like this cartoon version. So, an adaptation of a comic book of an adaptation of a TV series, this very late revival of what now seems to be known as Batman ‘66 is a very clever continuation in the only way possible; a pitch-perfect homage and a commentary on every Batman before and since! Does anyone really need to read a backstory on Batman in this article? The masked vigilante has been a part of the fabric of society since he appeared in comic form in 1939. That’s nearly eighty years to get to know him and it’s safe to say that he’s one of the most-loved and most-recognisable superheroes ever. So, in the ‘60s, a time of bold colours and bold decisions, it was decided to put him on the small screen with a now-classic American television series that featured Adam West as Batman and Burt Ward as his teenage sidekick Robin. After huge initial success, the third series ratings began to dip and the show was cancelled (though, as has been confirmed by both lead actors, another American network wanted to continue on and only didn’t do so because the entirety of the sets were destroyed to make way for new sets around the time the contract would have been signed – an unnecessary re-building expense the new network couldn’t match). But, due to the show’s brilliant appeal across the generations, it left such a strong impression that it took another 30 years before Batman returned in Tim Burton’s much darker film of 1989, which ditched the Day-Glo and dialled up the darkness. Michael Keaton’s Batman is the polar opposite of Adam West’s and every subsequent Batman since has gone for the slightly nuts, slightly eccentric, very violent version. This isn’t ignored in the cartoon version of the beloved ‘60s series and this is why Batman: The Return of the Caped Crusader works on as many levels as the live-action series itself did. I’ll be honest, I wasn’t expecting the cartoon element to look as good and work as well as it did (which is odd, considering that’s how it all started with the comics!). But, this is a beautifully realised element, with great character likenesses and fluid, realistic movements that draws you in straight away. The only oddness being that, whilst they strived to get everything so right in their recreation of the series it was based on, Commissioner Gordon (who Batman reports to) has suddenly grown a moustache. I kept expecting someone to allude to it or make a joke but it seems an accidental oversight (or an accidental overbite. Ahem). Talking of the precise attention to detail, special mention needs to go to the relatively unsung voice cast. The recreation of the classic line-up of villains is enhanced by original actress Julie Newmar returning to voice Catwoman (and doing so incredibly well and deliciously flirtatiously) but it’s the vocal impressions of Frank Gorshin’s Riddler, Buster Meredith’s Penguin and – especially – Cesar Romero’s Joker that truly stand out because they don’t stand out. If you get my meaning? So close are the vocal matches to these sadly deceased actors that it’s a true tribute when you wonder if their three distinctive laughs have at least been sampled from the old episodes! Commissioner Gordon and Chief O’Hara are equally brilliant and the perfect vocal renditions are even extended to Bruce Wayne’s Aunt Harriet and his butler, Alfred Pennyworth. But, what of our dynamic duo? Well, Burt Ward’s Robin is exactly the same. So much so, that it doesn’t sound like a day has passed since Ward played the role originally. He captures the youthful enthusiasm and straight sincerity of the delivery, as well as the energetic passion he put into playing Robin in the ‘60s. It’s a real masterclass in voice acting, as he gets it so right that it’s probably the reason that Adam West’s Batman sounds off. Yes, sadly, the years have taken their toll on West’s voice and it’s not the smooth, silky, urbane tones of yesteryear. He has moments where you’re transported back in time but mostly it sounds like an older parody of himself. That’s to be expected, really, as he’s been called upon to play that sort of exaggeration for a long time now – for comedic affect. But, his performance in the television series is so straight and so dry in wit that the comparison has to be made. It’s never a bad performance, and he oddly hits the mark when his Batman goes ‘dark’ in this version due to Catwoman’s catnip scratch turning him slowly evil, but you just can’t hide the fact that his voice is different. Once you accept that, and it’s easy to do, then it doesn’t jar and isn’t a problem at all. He’s still got killer comic timing and genuine chemistry with Burt Ward. It is just a real shame that it has taken so long to embrace the idea of a revival of this original series, when West was a little younger than his 88 years of today. The story itself feels like it could have been an unmade script for a fourth series, if it had happened. Michael Jelenic and James Tucker create a homage to the wordplay and wackiness of what went before, as well as subtly updating things and adding in Easter Eggs for Batman fans young and old. There’s some brilliant lines and situations, with an out-there plot that matches the surreal nature of the series that it recreates. It basically all revolves around a scientist creating a replication ray-gun, which is stolen by the villains and then retrieved by Batman (who uses it on himself, as he slowly loses his morals due to a run-in with Catwoman). It’s a lot of chasing about and there’s a lot of punch-ups, with the requisite sounds displayed on screen with appropriate words in big, bold, colourful lettering (KER-POW! SPLAT! PLONK!). As with any good episode, there’s the Batcave displayed in all its glory and we see how long the tunnel really is that takes us out of there and onto the main highway (with a lot of amusing ‘doors’ opening along the tunnel, which keeps out the anyone who might venture down there unexpectedly). There’s also – like the Batman film that cashed in on its success, which came between series – a display of Bat-vehicles used too. In a way, this cartoon takes its cue from that film version, with exactly the same line-up of villains, as well as a plot device that revolves around a ray-gun that does something amazing that can be used for good *and* evil. It’s a good template to use as it features all the right elements and really gets the series feel spot-on. Even in the end credits, Batman is running about (and juggling) comedy bombs – referencing the best scene in the 1966 movie where he runs around a pier trying to dispose of a fizzing bomb and keeps getting foiled by Nuns, a Salvation Army Band, a kissing couple, etc, etc; all of whom he can’t detonate the bomb near. 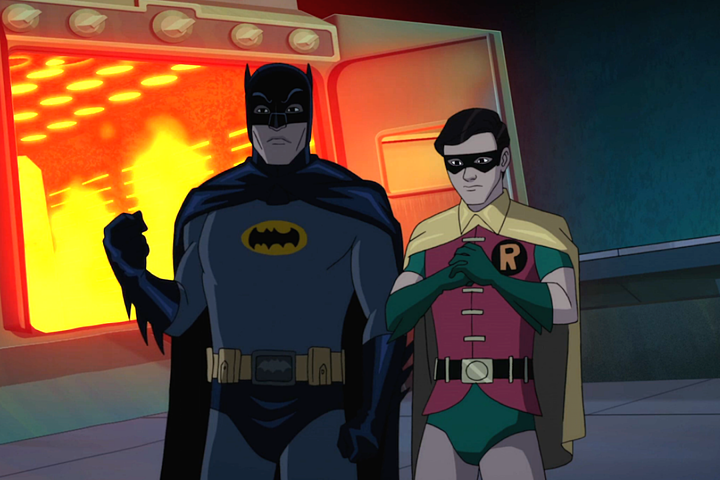 Director Rick Morales does a grand job of getting the cartoon to ape the series but also adding flourishes of his own, with a loving sweep-around of the Batmobile before the jet rockets fire and it takes off out of the Batcave. The famous ‘tilted’ camerawork that sets the villains scenes apart from the heroes scenes is on display and his camera choices for the animation is really striking on numerous occasions. I watched this with my two young daughters, who have always loved the bright and bouncy spectacle of the Batman series, and they sat transfixed at this. Often, I’d laugh at the in-jokes that they didn’t get, which are difficult to explain to a non-fan (the opening credits showcase some famous DC Comics covers from long ago, for example, and lines of dialogue from Burton’s Batman film and also from Christopher Nolan’s acclaimed Dark Knight trilogy of films pop up in appropriate places) but don’t detract from the story, visuals or plot if you don’t get them. Both daughters instantly asked to watch more when it was over. It’s good to hear that a sequel is actually in development, which will feature William ‘Captain Kirk’ Shatner as the main villain, Two-Face. An absolute masterstroke of casting, in my opinion, and the sort of role he would have been offered in the ‘60s – where all the villains on the series were played by respected and current actors having a ball with their over-the-top characterisations. My favourite moment? When Batman gets hit around the back of the cowl by Penguin’s umbrella as he’s talking to Catwoman and starts seeing triple (a lovely realisation of two ‘extra’ Catwomen and a justified shout-out to Lee Meriwether and Eartha Kitt, both of whom took over the role when Newmar wasn’t available for the 1966 movie and for Series Three of the series respectively). It’s groovy to have the original live-action caped crusaders back, especially as they fit this cartoon format so perfectly, and this is a lovingly and lovely tribute to what came before with an ironic nod and a wink along the way. I hope the sequel is just as good!